Washpit Cottage01485 600334work Self-cateringThe village of Grimston is a small hamlet surrounded by beautiful countryside yet within close proximity to the Royal Estate of Sandringham and the North West Norfolk Coast. With Roydon Common Nature Reserve, Congham Hall with its well known herb garden and Castle Rising on the doorstep, this part of Norfolk has a lot to offer the visitor. It is excellent for walking and cycling and further amenities can be found in the historic town of King's Lynn and the seaside resort of Hunstanton. 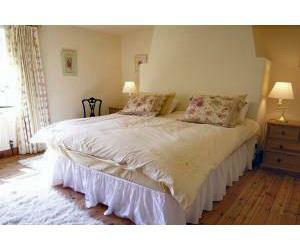 Washpit Cottage is set in its own 10 acre haven and offers spacious, luxurious accommodation. The inglenook fireplace with its large woodburner and the welcoming AGA make for a warm and cosy atmosphere especially in winter. Ideally located for the beautiful Norfolk coast and the well-known villages of the Burnhams, Brancaster, and the small towns of Wells and Hunstanton. Sandringham House and Oxburgh Hall (National Trust) are a short drive away. A variety of local pubs offering mouth-watering menus and cosy atmospheres are well worth a visit. A welcoming hamper containing local bread, whisky marmalade, English butter and milk is provided Shop: 1.5 miles Pub: 1.5 miles. Bedroom 1 with a king-size bed and En-Suite Bathroom with shower cubicle, washbasin, bidet and w.c.
Bathroom with bath, over-bath mixer shower, washbasin, bidet and w.c.
Garden: The garden is large and open plan. Wooded, landscaped and grassed with a patio area at the front. There is a large, uncovered pond in the grounds (care should be taken with young children at all times). Also Provided: Logs for the woodburner. Towels. Stairgate. Books and games. Pets: One dog by arrangement, and to be kept downstairs at all times, the garden is not enclosed. The village of Grimston is a small hamlet surrounded by beautiful countryside yet within close proximity to the Royal Estate of Sandringham and the North West Norfolk Coast. With Roydon Common Nature Reserve, Congham Hall with its well known herb garden and Castle Rising on the doorstep, this part of Norfolk has a lot to offer the visitor. It is excellent for walking and cycling and further amenities can be found in the historic town of King's Lynn and the seaside resort of Hunstanton. Notes: Although a non-smoking property, smoking is allowed outside. Water is supplied to the property via a borehole. There is a water filter provided for anyone who may have concerns about the drinking water. Facilities for children: Narures own 10 acre woodland. Children welcome from any age. Come off A148 King's Lynn to Fakenham or Hellington on to the 1153 to Grimston. Old Grimston crossroads/post office. Turn left to Hassingham. The Washpit Cottage is 1 1/2 miles out of Grimston on the left. For Sat Nav Postcode is PE32 1DN.